I live in the southern half of France. It is not supposed to snow here. When it does snow here, like today, it doesn't make a pretty, crunchy white blanket. It just oozes into the mud, allowing me and the girl dog to make dirty, wet footprints all over the house. Not to mention that, when one lives where it's not supposed to snow, and it snows, no one has the slightest clue how to drive in it. 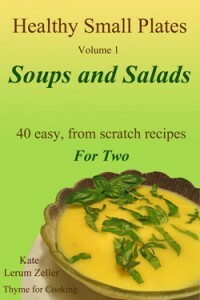 Having a kettle of soup bubbling away in the kitchen, perfuming the house, can make it, almost, worthwhile. Minestrone is one of our favorite soups. I have the long, slow version here, using dried beans. In soup pot or Dutch oven (4 or 5 qt capacity) heat stock over medium-high heat. Mince garlic and add to stock. Chop carrots, celery and onions; add to stock. Drain tomatoes, reserving juices and roughly chop; add to stock along with juices and sauce. To cut cabbage make a slice next to the core. You will probably use just that slice to get the 2 cups. Wrap and refrigerate the rest. Chop cabbage and add to stock. Cover and let stock return to hard simmer. Cook for 25 minutes. Cut ham into bite-size pieces and add to pot. Drain and rinse beans; add to pot. Add herbs to pot. Add the spinach to the pot – roughly chopping if the leaves are large. Break spaghetti into 3" (7.5cm) lengths and add to pot. Cover and simmer 20 minutes longer, until finished, stirring from time to time. Serve. Refrigerate the rest for later in the week. Note: In the U.S. one can buy jars of 'Ham Base' which would be good – the appropriate amount dissolved in 1 qt water. The Ham Base could be substituted for chicken stock in soups, etc. in the future. I don't want to recommend buying it for just this soup, thus the chicken stock. Asian Baked Salmon, Garlic Pan-Fried Lamb Chops, Potatoes Savoyarde and, of course, Christmas Eve Dinner…. Australia, and others in the Southern Hemisphere). Katie, It is snowing in the South also. We heard from friends in NC and there are 4 inches on the ground. Does not happen too often. But I was hoping it would hold out until we returned for Christmas. Your soup looks perfect. I was watching the news and saw visions of Paris covered in snow. Even Britain looked like parts of Canada at this time of year.A warm, welcoming bowl of soup would be a comfort. I’m with you. I really don’t like snow and wintertime either. But if we DO go camping, Soup in a Dutch Oven helps us handle the snow much better. Amazingly, even though it does snow here every year, people are still clueless about how to drive in it. I’m with you on the soup, the pot of soup on the stove . . . mmm. Your minestrone looks so wonderful. We have just a light dusting of snow here in IL. 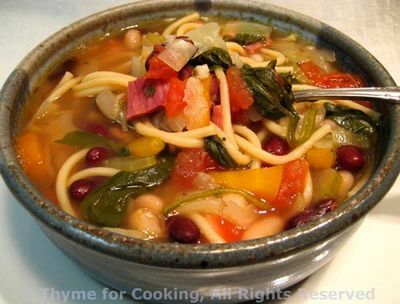 Big time snow storm here on the east coast~time to make this wonderful minestrone! I love to put a pot of soup on simmering on those cold wintry days. The aromatics of the combined vegetables seasoned with ham permeating my home is so heartwarming & makes for a welcoming spirit for anyone who enters. Your minestrone recipe is so hearty, as I like every ingredient in your perfect version.